Air Force Reservists Say Agent Orange Residue Damaged Their Health The planes used to spray Agent Orange in Vietnam weren't retired from service — they were used by reservists in the U.S. for more than a decade after the war, exposing the crews to harmful chemicals. 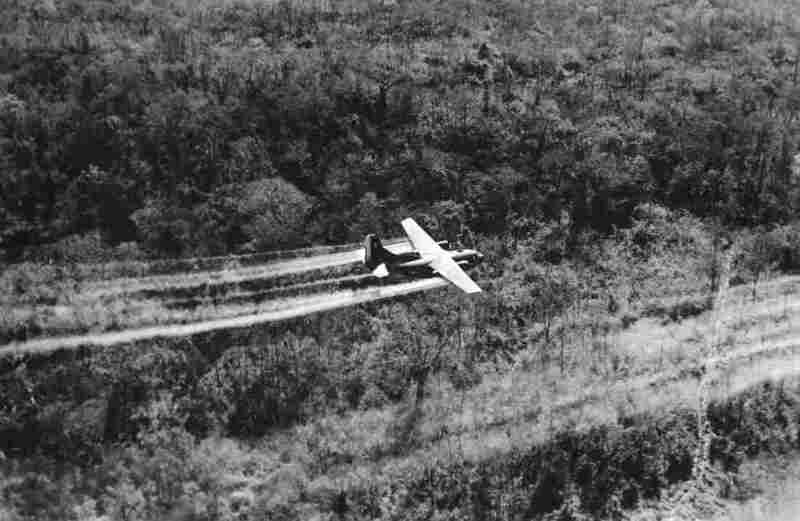 A U.S. Air Force C-123 sprays herbicides on dense jungle beside a South Vietnamese highway on May 18, 1966. This aircraft is the last in a formation of three. Spray from the other two planes can be seen ahead. 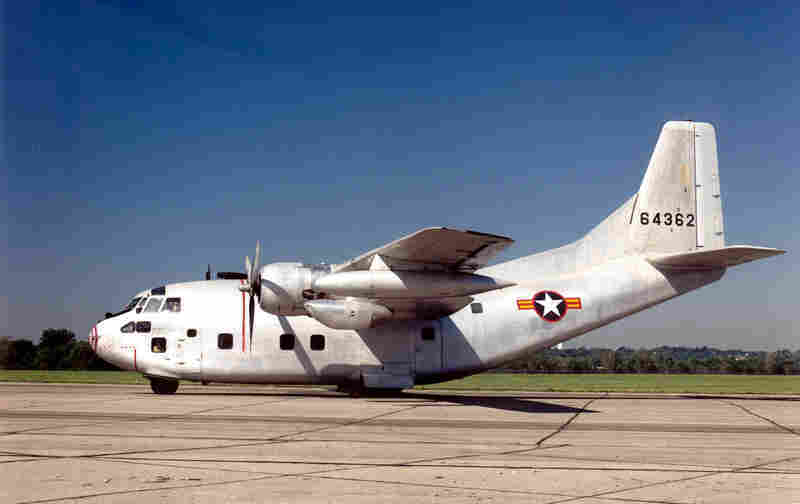 At the National Museum of the U.S. Air Force in Dayton, Ohio, a looping video shows off C-123 planes — aircraft used to spray the chemical defoliant Agent Orange and pesticides during the Vietnam War. The only actual C-123 you can still see here, nicknamed "Patches," has been on display inside this big hangar since the mid-1990s, when it was decontaminated. It's a wide, clunky-looking cargo plane. A Fairchild C-123K Provider at the National Museum of the United States Air Force. "They're big and slow, and they're extremely noisy," says Ed Kienle, laughing. For most of the 1970s, he was a flight mechanic on a plane just like Patches at Rickenbacker Air Force Base in Columbus. "We know that most of the airplanes we flew had done duty in Vietnam." An unknown number of U.S. troops and Vietnamese civilians were exposed to Agent Orange, the chemical defoliant the U.S. used in Vietnam. And it turns out that some Air Force reservists may also have been exposed to the chemical after the war — not in Vietnam, but in the U.S.
That's because the planes used to spray Agent Orange were used for another decade by the Air Force reserves at Rickenbacker, the Westover Air Reserve Base in Massachusetts and the Pittsburgh Air Reserve Station. Vets who worked in those planes have been pushing the U.S. Department of Veterans Affairs for recognition — and they're starting to get it. Back during the war, the issues with Agent Orange hadn't all come to light. When the planes returned to the United States in 1971, guys like Kienle flew long missions for years in close contact with leftover chemical residues. "We knew it was pretty nasty," he says. "The plane smelled bad. But you really weren't that concerned about it at the time — until later on, after you're retired, and these health issues start popping up." Kienle was one of as many as 2,100 people who crewed on the C-123s here in the U.S., although there's no official count. Now lots of the folks who worked on the planes have health problems that the VA concedes have been associated with Agent Orange: diseases like prostate cancer, non-Hodgkin lymphoma or diabetes. But it's hard to show cause and effect in a lot of these cases. Because of that, vets who were in Vietnam and have health problems that could be associated with Agent Orange can get benefits based on just the possibility they were exposed. The VA offers disability compensation and money for survivors of the deceased. But as of now, almost all benefits claims related to Agent Orange for C-123 reservists have been denied. Jeanne Stellman, a public health professor who has done extensive research on Agent Orange at Columbia University, worked on an article published last year in the journal Environmental Research that blasts the VA for ignoring the science. "It seemed to us to be a total no-brainer that there was exposure possible," she says. Since 2011, a growing group of reservists and their families has been calling for the VA to recognize C-123 vets. A study released in January, commissioned by the VA, confirms that many reservists very likely were exposed. Dr. Ralph Erickson, a VA health expert, says a task force will make recommendations to the VA secretary within months on next steps. "I think we're a learning organization, we're able to make the adjustments that are necessary, and we're basically moving forward at this point," Erickson says. For Barbara Carson, it feels like too little, too late. Her husband, who worked on a C-123 at Rickenbacker, died of non-Hodgkin lymphoma at age 54. Years later, she filed a claim with the VA for survivors benefits linked to Agent Orange exposure. That claim was denied, a ruling she is appealing. She says it's frustrating because if her husband had been on the ground in Vietnam, she'd be eligible for benefits owing to the presumption of exposure. "I guess I was naive enough to believe that they would've been responsible in their reaction," Carson says.